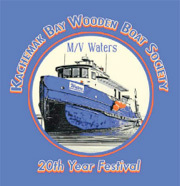 Festival 2012: "In The Books"
The 20th Annual Kachemak Bay Wooden Boat Festival is in the books, and it sure was memorable! Our Thursday night we swarmed the Dawg with song and some incredible stories of seafaring derring-do, and some shoreside high jinks as well. Meezie Hermansen represented the fisher poets, our own Bumppo, Dan VeerHeusen, Findlay Abbott, and Olga Von Ziegesar entertained us with stories of old Homer, and the Rubber Bootleggers sang at their very best. Friday night Glenn Caldwell stole the show with his raconterial skill. We owe him a lot for getting the whole Festival idea off the ground in the first place, back in 1992. He was followed be a wonderful movie, “Charlotte,” about the Gannon and Benjamin yard back east at Marblehead, a little burg reminiscent of Homer, where the whole town turns out for a launching. We still have copies for sale at the very reasonable price of $25. Saturday the usual swarms of kids were hammering and painting and drying their boats on the big stove. Norm Griffin showed up and beamed at the fuss made over him. He’s done so much for us and others in his quiet steady way. We had net mending with Jim James, and bronze casting with Dan Young and Leo Vait. Good show, gentlemen! Dan is a steam guy and machinist, and Leo can do anything artistic. Saturday evening brought the sunshine, and our auction suffered significantly, but those who were there made out like bandits, yours truly included (I bought the wineglass wherry kit for $700 eat your hearts out!) My heart was sinking when our intrepid auctioneer Bumppo looked around at the (lack of) crowd and said, “OK, there’s gonna be some deals tonight! Later, the Rogues and Wenches pulled in a good crowd and we danced til we dropped. Great Show! Sunday more sunny weather at the festival site on the Spit. Our hot dog guy from up the road was very popular. I had dogs for breakfast and lunch. The Smolt, Bristol Bay double ender from Seldovia, floated beautifully just off shore, unfortunately unavailable for rides due to a funny combination of falling tide on a flat beach and an onshore chop. Lots of nice boats were represented, and the canoes of Norm Griffin (supposedly his last boat, ya sure!) and Dave Brann’s Old Town got lots of conversation and accolades. 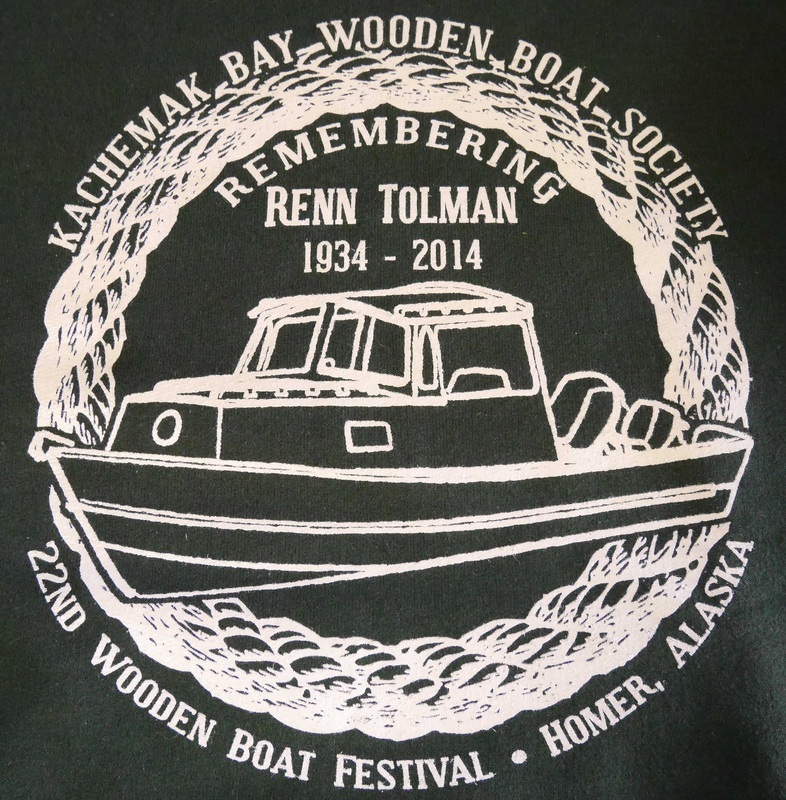 Renn Tolman was his inimitable self, Ryjil Christianson did Ted Pedersen’s Whaleboat proud, and we had everything wrapped up by 9pm, for a last drink at the Dawg with those lucky enough to last that long. 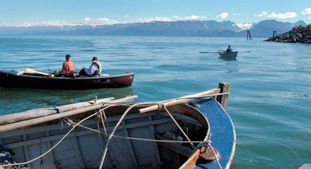 John Miles and Cam Forbes went beyond the call of duty towing the Smolt back to Seldovia the next day. The 20th Annual Wooden Boat Festival, held in the unpredictable weather of a late September weekend, was a success! Participants carried on through some blustery, rainy first days, and were rewarded with a gorgeous Sunday to close out the Festival. 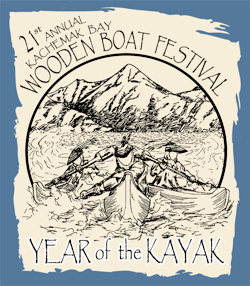 The 20th annual Kachemak Bay Wooden Boat Festival is here in a month. All the pieces in play for months now come together on the 6, 7, 8, and 9th of September. We’ve got a great festival planned for our 20th celebration. 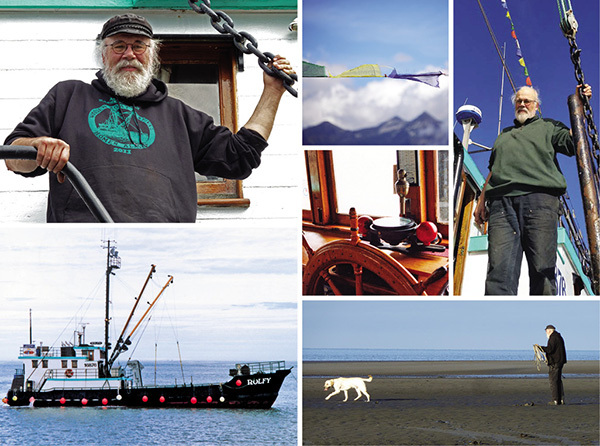 We’re honoring the 73’ M/V “Waters,” which, like the Boat Society itself, has had its ups and downs over the years. 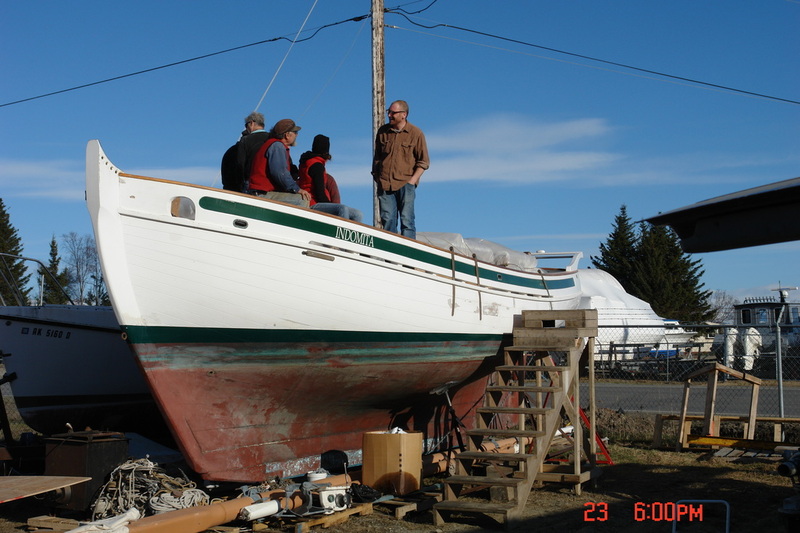 She was built for the army by Stephens Brothers in Stockton, CA in 1943 of 2 ½” Douglas Fir planking over bent oak frames. Her original designation was USA ST (small tug) 413. After the war she was transferred to the Federal Aviation Agency, renamed the Fedair III, and survived sitting for 5 years, and through a succession of owners, until being purchased by John Rogers and converted for charters and bear watching tours. 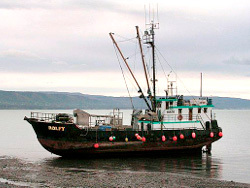 She has great tugboat lines and has warm and comfortable accommodations. We are planning to have her open for tours. More info at the Festival.